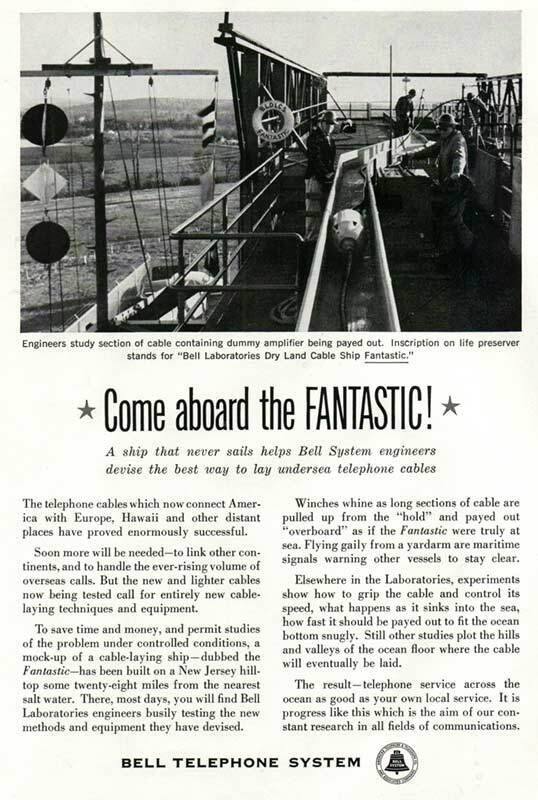 A ship that never sails helps Bell System engineers devise the best way to lay undersea telephone cables. The telephone cables which now connect America with Europe, Hawaii and other distant places have proved enormously successful. Soon more will be needed - to link other continents, and to handle the ever-rising volume of overseas calls. But the new and lighter cables now being tested call for entirely new cable-laying techniques and equipment. To save time and money, and permit studies of the problem under controlled conditions, a mock-up of a cable-laying ship - dubbed the Fantastic - has been built on a New Jersey hill-top some twenty-eight miles from the nearest salt water. There, most days, you will find Bell Laboratories engineers busily testing the new methods and equipment they have devised. Winches whine as long sections of cable are pulled up from the "hold" and payed out "overboard" as if the Fantastic were truly at sea. Flying gaily from a yardarm are maritime signals warning other vessels to stay clear. 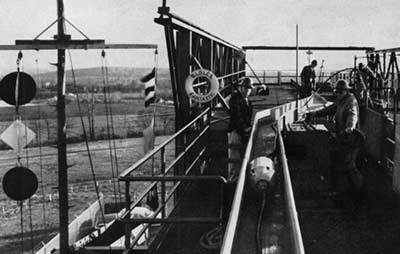 Elsewhere in the Laboratories, experiments show how to grip the cable and control its speed, what happens as it sinks into the sea, how fast it should be payed out to fit the ocean bottom snugly. Still other studies plot the hills and valleys of the ocean floor where the cable will eventually be laid. The result - telephone service across the ocean as good as your own local service. It is progress like this which is the aim of our constant research in all fields of communications. 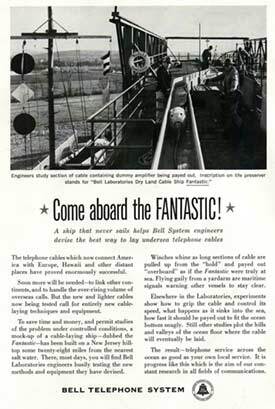 "Bell Laboratories Dry Land Cable Ship Fantastic." i.e. unable to take evasive action, is on the left of the photo. It consists of a white diamond with red discs above and below.